In some companies, “I’m busy, I don’t have time to call the lead right now, I’ll get back to them in 15 minutes after my break” could get you fired. In the post-Internet era of self-directed buying behavior, the sales representative who responds to an inbound inquiry inside 5 minutes of lead registration is 4 times more likely to qualify a lead than if they wait another 5 minutes to respond. 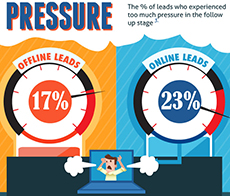 The infograpic from Salesforce.com provides dramatic evidence of the need for responsive follow-up to online leads. Wait a further 20 minutes and the sales representative who responds in 5 minutes is 20 times more likely to qualify the lead than the rep who goes on break. After one hour a lead is a cold as a mother in-law’s kiss. With the cost of an inbound lead somewhere between 55-62% less than an outbound lead, companies practicing inbound marketing cannot afford to be anything less than fully committed to responsive sales enablement. B2B companies not practicing inbound marketing will struggle to fill lead pipelines, become less competitive and will be marginalized by their competition generating inbound leads with a lower CAC and more responsive engagement process. What do we need for responsiveness? 10.Keep it simple, but get everyone on-board. WittyParrot is a disruptive content distribution platform with potential to change the way salespeople work, manage information and interact with customers. This is a bold claim and a demonstration is a must for sales managers and salespeople to “get-it”. Sales Enablement and operations professionals see the WittyParrot product for the first time and go “wow”, how come nobody figured this out until now? As well as enabling responsive sales engagement with buyers, using the product saves salespeople time, improves the quality of response and delivers analysis of information used, individual usage and time saved. WittyParrot is like a sales portal on steroids… in fact it gives everyone their own personal sales portal right on their desktop with information accessible in usable chunks instead of documents. The product manifests as a Widget on desktops, smartphones and tablets and is updated via the cloud, so that the freshest content is always present. WittyParrot places the content that salespeople need at their fingertips and they can use it whether they are on-line or offline. The graphic below is a screenshot of the WittyParrot Widget being used to create an on-the-fly custom email response. This Widget enables salespeople to access relevant information to support buyer-seller conversations in real time. Simply drag and drop this information chunk (Wit) into an email or CRM tool to immediately follow-up the call with a written meeting summary, including links to resources and confirming next steps. WittyParrot brings a powerful set of capabilities to compliment inbound marketing, CRM and telecommunications infrastructure to elegantly solve the problem of responsive sales engagement.